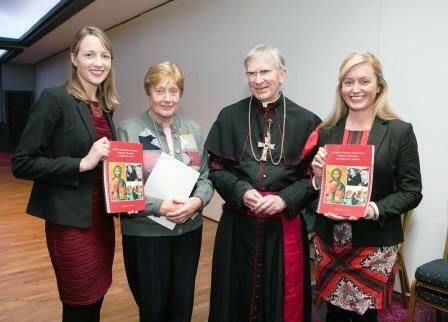 The first ever all Ireland Religious Education Curriculum for Catholic Primary Schools, north and south, was Launched in the Diocese of Cork and Ross by Bishops John Buckley in the Oriel House Hotel, also in picture, L to R., Emily O’Regan, Teacher at Kilbrittain N.s., Sr. Geraldine Howard, Co-Ordinator of Primary Religious Education in the Diocese of Cork/Ross and Aoife O’Callaghan, Teacher St., Joseph’s N.S. Glanmire. Picture, Tony O’Connell Photography. ‘Grow in Love’ the new programme for teaching religion in our Catholic Schools has been introduced in schools throughout Ireland. Here in the Diocese of Cork and Ross four In-Service Evenings have been held in Bantry, Clonakilty, Glanmire and Ballincollig. The sessions were facilitated by Aoife O’Callaghan from Riverstown N S Glanmire and Emily O’Regan from Kilbrittain NS to the principals, teachers of Junior/Sen. Infants and clergy were introduced to the mechanics of the New Curriculum. The sessions were received with great positivity and enthusiasm. We hope that this new programme will re-vitalise and enhance the teaching of religion in our Catholic Schools. St. John Baptist De La Salle (Patron Saint of teachers) pray for all those involved in this onerous work.